I am not a beer drinker. I’ve probably consumed five beers in my entire life. 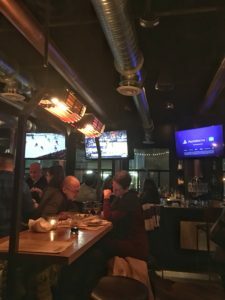 But when my daughter and I discuss where to go for a night out, I suggest a visit to the beer-centric Owen’s Ordinary at Pike and Rose in N. Bethesda. I plan to drink cocktails and wine, while she indulges in a selection of craft beers. Little do I know that this outing will prove to be life-changing. It turns out that beer is far more interesting than the pale lagers I hesitatingly chugged a few times in college, and have ignored ever since. 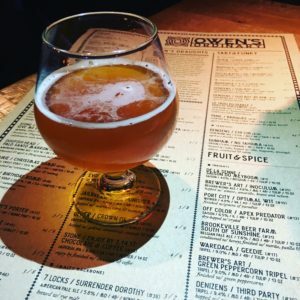 Owen’s Ordinary is part of the Neighborhood Restaurant Group, which includes Iron Gate, Hazel, Birch and Barley, and many more. The restaurant’s centerpiece is its beer program, directed by Greg Engert. The menu features American comfort food, designed by Executive Chef Anthony Piscioneri. 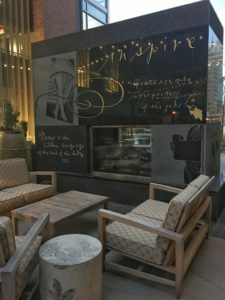 Food and drink can be enjoyed in a 60-seat outdoor beer garden, or in the lively bar or dining rooms accented with steam punk design. The extensive draft list at Owen’s Ordinary piques my interest. Beers are divided by flavor profiles – crisp, malt, roast, hop, tart and funky, fruit and spice. I am particularly fascinated by the description of finishes, which include caramel sauce, raspberries, green peppercorns, chocolate and coffee. Wait…what? I initially stick to the cocktail plan, ordering Laotian Lemonade with Tito’s vodka, vermouth, cucumber, ginger beer, lemon, and kafir lime. It’s a refreshing drink, but I find myself gazing longingly at my daughter’s beer. I take a sip of the tart and funky Toccalmatto/Dr. Caligari with its pleasing fruity finish. A few sips in and I’m swayed from my “beer is meh” opinion into a new state of “maybe I actually like beer.” For the first time in my life I order beer, starting with the Toccalmatto and continuing on to a locally brewed South of Sunshine beer from Brookville Beer Farm. It’s a delightful Belgian pale ale conditioned with honey, and finished with morita, pasilla, and ancho chilies. Three days later I return to Owen’s Ordinary for Valentine’s Day dinner with my husband. Now I’m really into it, proudly ordering Prairie/Birthday Bomb, an Imperial sweet stout finished with caramel sauce. I am in love! The food at Owen’s Ordinary holds up well to the liquid libations. 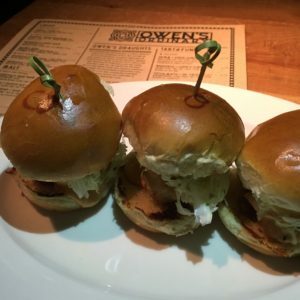 Starters include a satisfying trio of crispy shrimp sliders with spicy mayo, pickled jalapenos, and a cooling slaw. 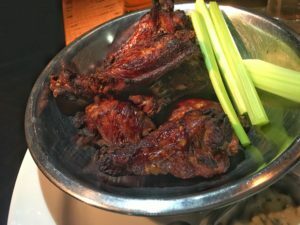 Owen’s Chicken Wings are winners- double fried for a crispy exterior and juicy on the inside. They are paired with a selection of sauces. There’s habanero cilantro (too hot), serrano mango (just right), or chipotle bbq (next time). Main course options range from fish and chips, coffee rubbed brisket, steak, roasted chicken, and fish. Roasted branzino with avocado, picked red onion, jalapeno and watercress salad is well-prepared. 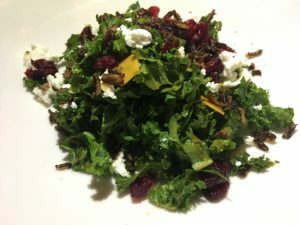 I’m more excited, however, by Harvest Salad with kale, tiles of squash, pomegranate, and goat cheese which is perked up with crunchy bits of forbidden rice. The fact that salads can be rationalized as a balance to calorie-laden beer is another plus. Of course if calories are of no concern, Owen’s Ordinary offers ice cream by Dolcezza along with glazed chocolate doughnuts, apple and cranberry crisp, and maple pot de creme. Sometimes you spend your entire life thinking one thing, only to be enlightened at a later date. It’s a humbling experience. Beer and I have some catching up to do. Anyone want to meet me for a cold one at Owen’s Ordinary?